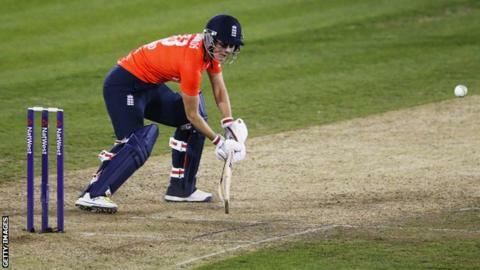 An unbeaten 62 from Charlotte Edwards guided England to a nine-wicket victory in the first Twenty20 international against South Africa at Chelmsford. Edwards hit 10 boundaries from just 54 deliveries as England easily chased down South Africa's modest total of 89-4 inside 14 overs. "The way we played today was exceptional," said Edwards, who made her ninth T20 half-century. Opener Dane van Niekerk top-scored for the tourists with 36. Edwards made her fifty from 47 balls and sealed an emphatic victory by smashing Marizanne Kapp through the covers with 39 balls to spare. "If we can carry on this level of performance we're going to do well in this series," Edwards told BBC Sport. "I knew we were only a game away from putting in a proper performance and tonight we did. "I'm pleased to be scoring runs and contributing. I'm happy to be in good form and you've got to make the most of it." The three-match series continues on Wednesday in Northampton before the final meeting in Birmingham on Sunday. There will be live commentary of both matches on the BBC Sport website.